The German military was the largest employers of motorcycles during World War II 1939-45. On June 22, 1941 Germany launched its Operation Barbarossa, the 3-million-man invasion of the Soviet Union. 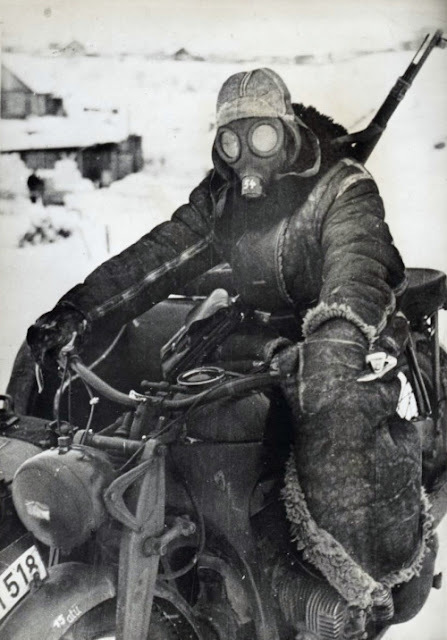 During the campaigns that followed, the military motorcyclist served a variety of functions including chauffeur service for officers, delivering dispatches, even hot meals, as scouting patrols, as point vehicles taking the brunt of battle, sometimes as specially equipped tank destroyers. As with all motorcyclists, there was a kinship among these soldiers who called themselves “kradmelder” (military motorcycle messenger). They rode exposed without the armor plating of the Panzers, without the safety of hundreds of foot soldiers beside them. Moving targets as it were, sniper magnets, and then there were mine fields, artillery fire, and strafing aircraft to contend with.